Continued from Grand Canal Tour, Part 2. South of the Rialto Bridge, the canal is lined with crowded fondamente on both sides. Directly after the bridge you will see a short stretch of smaller palazzi, some from the 1400s or earlier and some modern reconstructions. Though none is noteworthy in itself, together they make up one of the loveliest building ensembles in Venice. Beyond these are the large Palazzo Dolfin-Manin, a work of Sansovino (now the seat of the Bank of Italy) and the Gothic Palazzo Bembo, the birthplace of Pietro Bembo and now one of the more affordable hotels on the Grand Canal. Near the end of this fondamenta (the Riva del Carbon) are Venice’s municipal buildings, including the 12th–14th-century Ca' Loredan (later owned by the Corner family and birthplace of philosopher Elena Lucrezia Cornaro Piscopia) and Ca' Farsetti, built by the descendents of Doge Enrico Dandolo. At the next canal, on the left, is the Renaissance Palazzo Grimani, designed by Michele Sanmicheli in the 1560s and now used as law courts. After the small canal (Rio di San Luca), the Palazzo Corner Contarini dai Cavalli (1445), a late-Gothic palace, takes its name from the horses on the coats of arms. Today it houses offices of the justice ministry. Just before the next canal is the Palazzo Benzon, where the footloose Countess Marina Querini-Benzon entertained Byron; today it's a hotel. 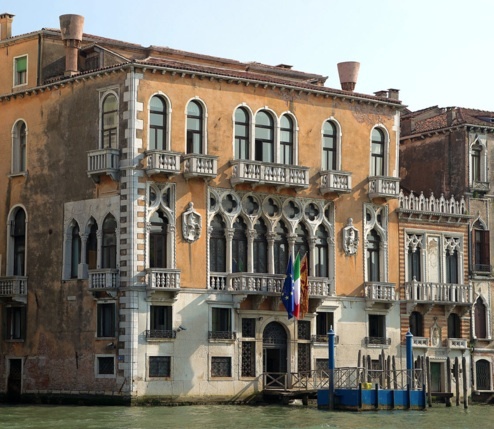 To the right of the Rio Ca’ Corner, the elegant building with the tri-lobed balconies is the Palazzo Corner-Spinelli, one of the definitive Venetian Renaissance palaces, designed by Codussi and modified by Sanmicheli. A few forgettable palazzi follow, before the huge compound of another great Venetian family, one that produced seven doges. The Palazzo Mocenigo is really four connected palaces in a row, built at various times from the 16th–18th centuries. Lady Arundel rented rooms here, as did Byron; the famous mystic Giordano Bruno stayed here, before shocking or boring his Mocenigo host so seriously with his heretical opinions that Mocenigo turned him over to the Pope for burning in 1592. Next is the Palazzo Contarini delle Figure, so called from the figures on the façade, just under the balcony, of a man and woman tearing out their hair (according to legend, they represent a gambling addict and his wife, whom he had just gambled away). It is one of the few palazzi in Venice with a pediment over the central windows. It belonged to the Marchese Alessandro Guiccioli, husband of Byron's most famous Venetian love, Teresa Guiccioli. Then there follow two more Gothic palaces, the Palazzo Erizzo Nani-Mocenigo and Palazzo Lezze. After the long Fondamenta del Vin, opposite the Palazzo Grimani are two 12th–13th century survivals, the assymetrical Palazzo Barzizza and Palazzo Giustinian Businello. Next to it, with the obelisks, the Palazzo Papadopoli was once owned by the Tiepolo family; when a young Grimani courted one of the daughters and was refused, he got his revenge by building the aforementioned Palazzo Grimani opposite, with windows 'bigger than the doors' of the Tiepolo house. One street further down are two adjacent Gothic buildings both much altered and both called Palazzo Donà; the one on the left is often referred to as ‘alla Madonnetta’ after the early Renaissance Madonna set in a shrine on its façade. After the next canal, the Palazzo Bernardo, is also 15th-century Gothic; Francesco Sforza, future Duke of Milan, lived here in the 1450s while he was still a mercenary condottiere working for Venice. After the broad entrance to the Rio di San Polo, the Palazzo Barbarigo della Terrazza (1569) takes its name from its sumptuous roof garden; a famous collection of paintings, with most of Venice’s Titians, was once kept here, but it is now in the Hermitage in St Petersburg – in the sad days of the 1850s the Barbarigi had to sell the collection to the Tsar. Today the ground floor houses a German institute for Venetian studies, while the upper floors house a hotel. Next, the Palazzo Pisani Moretta is a delicate Gothic confection, like so many of its fellows completely redone inside in the 18th century (and the best art here, an important Veronese, ended up in the National Gallery in London). It's now used for special events, including the annual Doge's Ball during Carnival. As far as Ca’ Foscari, two canals down, the rest is of little interest. Here and there Byzantine and Gothic fragments are incorporated into later buildings, like the venerable stone lions by the main door of the Palazzo Marcello dei Leoni.